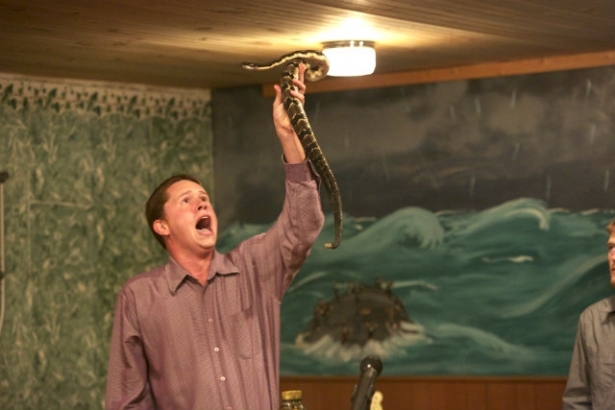 The promo reads accordingly, “In the hills of Appalachia, Pentecostal pastors Jamie Coots and Andrew Hamblin struggle to keep a 100-year-old tradition alive: the practice of handling deadly snakes in church.” Snake Salvation pastors are one homily away from being another Darwin Award winner, a website recognizing individuals contributing to human evolution by self-selecting themselves out of the gene pool via death or sterilization via their own (unnecessarily foolish) actions. The Buddha never placed unconditional demands on anyone’s faith. And for anyone from a culture where the dominant religions do place such demands on one’s faith, it’s simply wrong. We read the Buddha’s instructions, which advises testing things for oneself and seeing it as an invitation to believe or not. One does not have to go looking for a snake in an effort to prove their faith. I don’t believe that’s what God’s about. Live your faith by helping the unemployed get employed, feed the hungry, help the homeless, help a child study for a difficult math test, love your wife and honor your employer and coworkers. For snake based faiths, pastors and members alike, your actions are deeply rooted in ignorance.